Her national shrine is in the church of the Immaculate Conception, P. Oliveros Street. Antipolo is located in the mountains, 12 miles East of Manila. This Madonna received her beautiful Aztec looks from a native artist who carved her in Mexico. She was brought to Manila by a Spanish general who had been named governor of the Philippines. This conquistador by the name of Juan Niño de Tabora sailed from Acapulco, Mexico to Manila in 1626, aboard a large trading galleon. The first permanent Spanish settlement in the Philippines had been established about 60 years prior and Muslims and Christians were fighting for control of the area. The story was told that the new governor's ship had weathered almost four months of dangerous stormy seas and a fire on board, only due to the presence of Our Lady. And so she became Our Lady of Peace and Good Voyage. As the patroness of the galleons she was sent on eight more journeys across the sea between 1641 and 1748. It is not implausible that General de Tabora had faith in the Mother of God, but it is even more probable that he was also using her for all she was worth to the Spanish crown. It seems that he was hoping to repeat the Mexican experience where a dark miraculous image of the Madonna had managed to appease and convert the native population. He didn't miss a beat in trying to duplicate those events as much as possible. Upon his arrival in the Philippines the statue was immediately honored as possessing supernatural powers and was escorted into Manila with a great procession, pageantry, and fireworks. When the governor died, the statue was bequeathed to the Jesuits who were going to build a great church for her in Sitio Santa Cruz. During the construction they housed her in the chapel of their little mission in Antipolo. Local Asian and Negroid tribes there had only begun to be Christianized about 40 years prior. They were not taking well to the religion of their European occupiers. Many preferred leaving Antipolo and moving deeper into the jungle to practice their way of life in peace. When the new church for Our Lady was finished, she refused it. Every time she was transported there she reappeared in a certain Tipolo tree, that is a breadfruit tree, after which the village was named. Antipolo simply means 'the breadfruit tree'. Like the natives, she too was rejecting something about the Catholic Church and preferred to stick with the trees. Eventually the conquistadores understood that the Heavenly Mother wanted to be connected with that tree and the village where it stood. What they did not want to understand was that she was expressing her solidarity with all things wild: nature and the people who lived in harmony with her. Sure, they were willing to grant her a connection with her tree - but conquistador style: They built a church near it, then they cut it down and built her a tabernacle from its wood. I don't think she meant to be in a dead tree, but she gave up trying to teach those stubborn men and submitted to her new home. The Virgen of Antipolo did not gain nation wide devotion until 1864, when her shrine came under the care of Recollect monks, an extinct branch of Franciscans. Interestingly, this order also cared for and venerated the Black Madonnas in Verviers and Liège, Belgium. Being a reform order may have endeared it to the growing number of Philippine nationalists who demanded independence and reforms in the Church. During the World War II occupation of the Philippines by the Japanese Our Lady was evacuated first to a hidden place in the mountains, then to a little church in Quiapo. Her return to the cathedral of Antipolo is celebrated each year with a great night time procession. 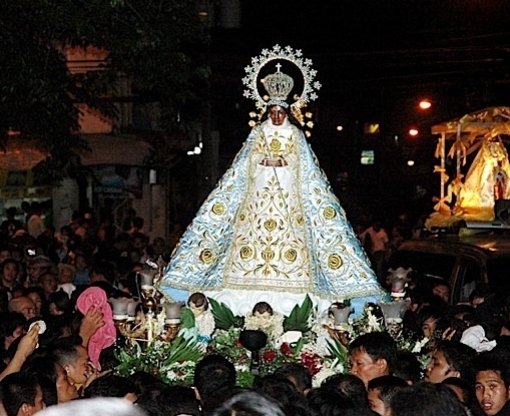 Thousands of devotees accompany this dark mother with songs and prayers, leaving Quiapo around 8p.m. on April 30th and arriving at her church in Antipolo at dawn on May 1st. In 1926 she was canonically crowned by the archbishop of Manila in the presence of more than 100.000 people.